BACKSTORY TIME! I originally made this set with a "how crazy can i possible be?" mindset, and they ended up being Pendulum Gemini Dual-Type Ritual Reptiles...which made for incredibly tiny text, unnecessary complications, and a rather chaotic archetype. I had a bit of lore around some sort of Aztec civilisation, but with google images, there was only so much I could do. I remade them a bit later, dropping one or two concepts, but it was still...a mess. I left them to the tomb of my hard drive, again unsatisfied with their implementation. Fast-forward to a few months ago, when I decided to revisit them. I had a few more images at this point, and decided to focus entirely on the Ritual/Pendulum aspect of it, as we hadn't seen any of that in the TCG/OCG. To make it more interesting, I made the Ritual Boses Wyrms, as a form of ascendence for this cult I had created in my mind around the Akkedis, and I built on the face-up in the Extra Deck theme, messing around with it as much as possible. And then...we had this. In designing this archetype, I wanted to balance between GY play and Extra Deck play, as my habit with archetypes I have created is to include some GY interaction, especially as cards quite often go from your Extra Deck to the GY here. However, I don't know if by doing both I have made one or both aspects weaker than they needed to be, resulting in a desynchronous archetype. Main aspects of Akkedis are Tributing AND dealing with Reptiles generically, considering how weak they generally are in today's meta. Really open to dealing with any broken interactions with this set and current cards in the TCG/OCG, as I do want to make these as fun to use as possible! Tributing monsters from the Extra Deck is meant to apply the same way as destroying monsters in the Extra Deck, as when you Solemn Strike a monster face-up in your Extra Deck, it goes to the GY and is considered destroyed. I think this is a reasonable assumption to make, but it could be stupid. 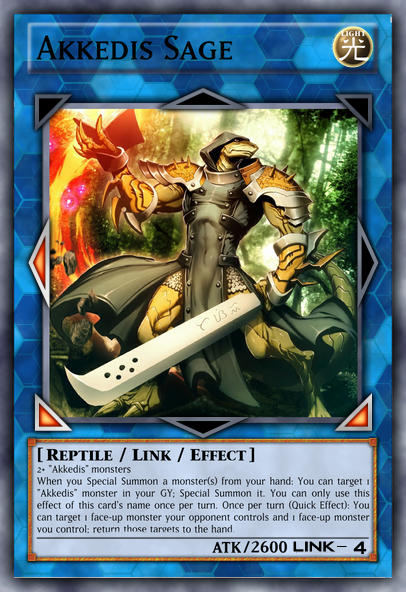 Once per turn, if you would Tribute a monster(s) for the Tribute Summon of a Reptile monster, you can Tribute 1 monster in your hand as the entire requirement for that Ritual Summon. 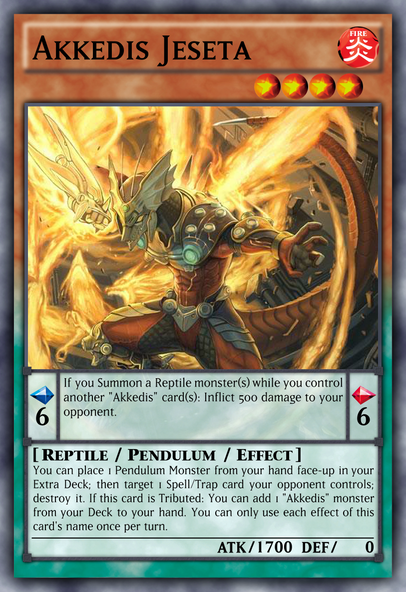 When this card is Summoned: You can add 1 "Akkedis" Pendulum Monster from your Deck to your Extra Deck face-up. If this card is Tributed: You can add 1 "Akkedis" card from your GY to your hand. You can only use each monster effect of this card's name once per turn. 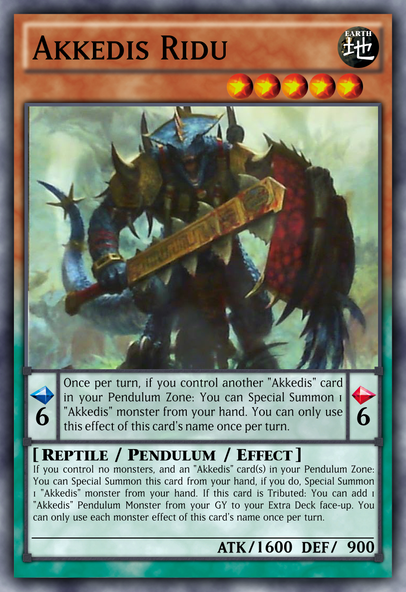 Once per turn, if you control another "Akkedis" card in your Pendulum Zone: You can Special Summon 1 "Akkedis" monster from your hand. You can only use this effect of this card's name once per turn. If you control no monsters, and an "Akkedis" card(s) in your Pendulum Zone: You can Special Summon this card from your hand, if you do, Special Summon 1 "Akkedis" monster from your hand. 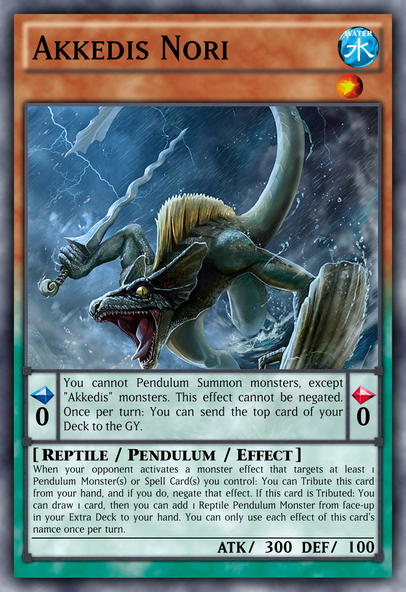 If this card is Tributed: You can add 1 "Akkedis" Pendulum Monster from your GY to your Extra Deck face-up. You can only use each monster effect of this card's name once per turn. When you Pendulum Summon, you can Pendulum Summon 1 "Akkedis" Pendulum Monster from your GY. 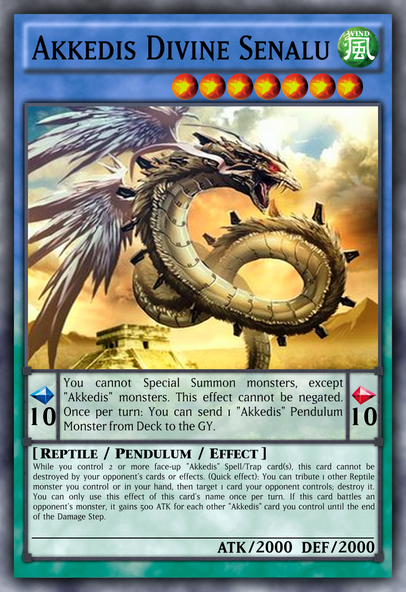 When this card is Summoned: You can add 1 "Akkedis" Pendulum Monster from your Deck to your Extra Deck face-up. If this card is Tributed: You can add 1 "Akkedis" Spell/Trap card from your Deck to your hand. You can only use each monster effect of this card's name once per turn. 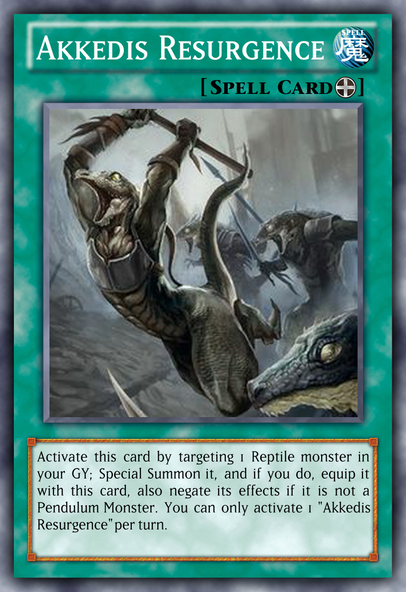 If you Summon a Reptile monster(s) while you control another "Akkedis" card(s): Inflict 500 damage to your opponent. You can place 1 Pendulum Monster from your hand face-up in your Extra Deck; then target 1 Spell/Trap card your opponent controls; destroy it. If this card is Tributed: You can add 1 "Akkedis" monster from your Deck to your hand. You can only use each effect of this card's name once per turn. Once per turn, if you control an "Akkedis" card in your Pendulum Zone other than "Akkedis Nagati": You can add 1 "Akkedis" card from your Deck to your hand. Once per turn: You can target 1 face-up monster you control; add 1 "Akkedis" monster with the same name as that monster from your Deck to your Extra Deck face-up, and if you do, that target can attack your opponent directly this turn. 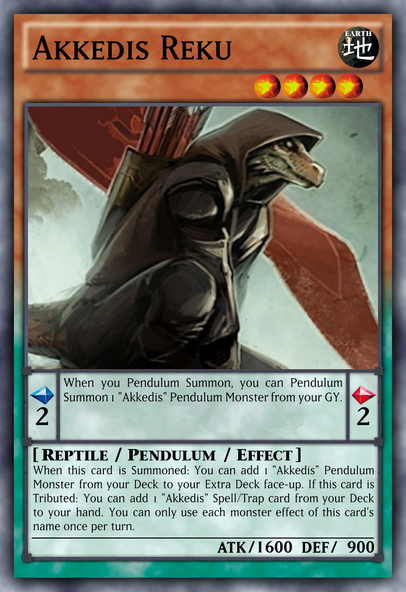 If this card is Tributed: You can target 1 "Akkedis" Pendulum Monster in your GY; place it in your Pendulum Zone. You can only use this effect of this card's name once per turn. Once per turn: You can Tribute monsters from your field or "Akkedis" monsters from face-up in your Extra Deck, then Ritual Summon 1 "Akkedis" Ritual Monster from your hand whose Level exactly equals the total Levels of those monsters. 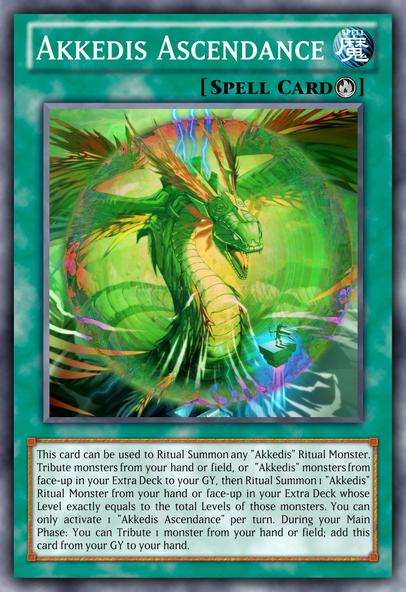 If you Ritual Summon exactly 1 "Akkedis" Ritual Monster with a card effect that requires use of monsters, this card can be used as the entire requirement. If this card is Tributed: You can add 1 "Akkedis" Spell/Trap Card from your Deck to your hand. You can only use this effect of this card's name once per turn. You cannot Pendulum Summon monsters, except "Akkedis" monsters. This effect cannot be negated. Once per turn: You can send the top card of your Deck to the GY. When your opponent activates a monster effect that targets at least 1 Pendulum Monster(s) or Spell Card(s) you control: You can Tribute this card from your hand, and if you do, negate that effect. 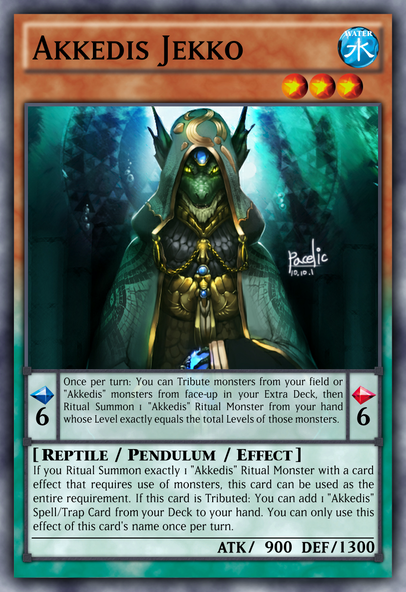 If this card is Tributed: You can draw 1 card, then you can add 1 Reptile Pendulum Monster from face-up in your Extra Deck to your hand. You can only use each effect of this card's name once per turn. You cannot Special Summon monsters, except "Akkedis" monsters. This effect cannot be negated. 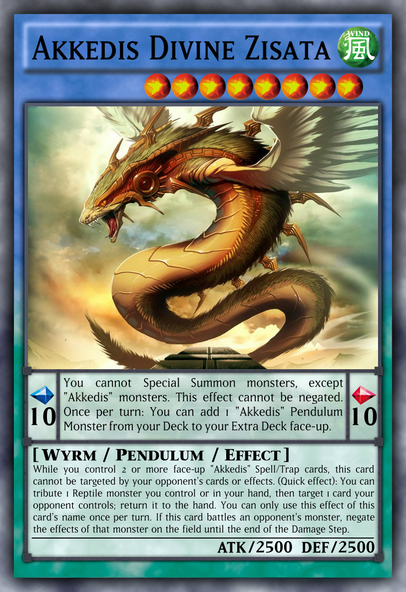 Once per turn: You can send 1 "Akkedis" Pendulum Monster from Deck to the GY. While you control 2 or more face-up "Akkedis" Spell/Trap card(s), this card cannot be destroyed by your opponent's cards or effects. 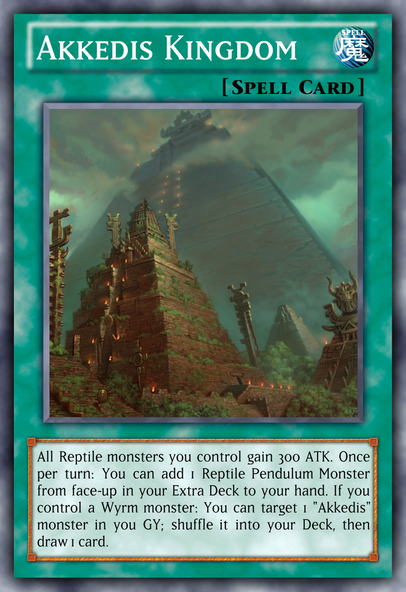 (Quick effect): You can tribute 1 other Reptile monster you control or in your hand, then target 1 card your opponent controls; destroy it. You can only use this effect of this card's name once per turn. If this card battles an opponent's monster, it gains 500 ATK for each other "Akkedis" card you control until the end of the Damage Step. You cannot Special Summon monsters, except "Akkedis" monsters. This effect cannot be negated. 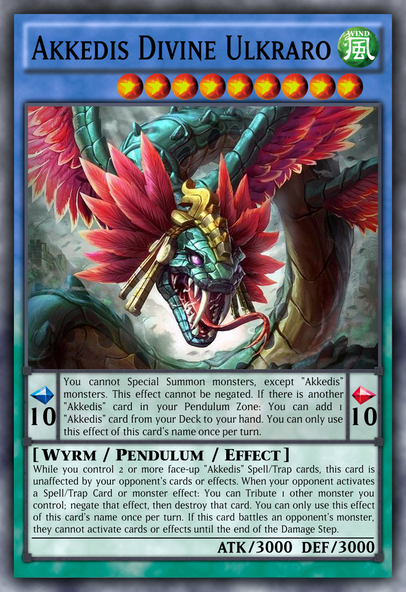 Once per turn: You can add 1 "Akkedis" Pendulum Monster from your Deck to your Extra Deck face-up. While you control 2 or more face-up "Akkedis" Spell/Trap cards, this card cannot be targeted by your opponent's cards or effects. (Quick effect): You can tribute 1 Reptile monster you control or in your hand, then target 1 card your opponent controls; return it to the hand. You can only use this effect of this card's name once per turn. If this card battles an opponent's monster, negate the effects of that monster on the field until the end of the Damage Step. You cannot Special Summon monsters, except "Akkedis" monsters. This effect cannot be negated. 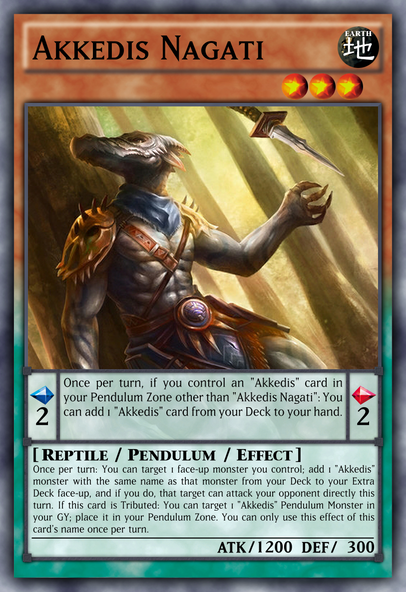 If there is another "Akkedis" card in your Pendulum Zone: You can add 1 "Akkedis" card from your Deck to your hand. You can only use this effect of this card's name once per turn. While you control 2 or more face-up "Akkedis" Spell/Trap cards, this card is unaffected by your opponent's cards or effects. When your opponent activates a Spell/Trap Card or monster effect: You can Tribute 1 other monster you control; negate that effect, then destroy that card. You can only use this effect of this card's name once per turn. If this card battles an opponent's monster, they cannot activate cards or effects until the end of the Damage Step. This card can be used to Ritual Summon any "Akkedis" Ritual Monster. Tribute monsters from your hand or field, or "Akkedis" monsters from face-up in your Extra Deck to your GY, then Ritual Summon 1 "Akkedis" Ritual Monster from your hand or face-up in your Extra Deck whose Level exactly equals to the total Levels of those monsters. You can only activate 1 "Akkedis Ascendance" per turn. During your Main Phase: You can Tribute 1 monster from your hand or field; add this card from your GY to your hand. You can Tribute 1 monster in your hand; add 1 Level 5 or higher Reptile monster from your Deck to your hand. You can only use this effect of this card's name once per turn. Once per turn: You can shuffle 1 "Akkedis" Pendulum Monster from your GY in your Deck, then 1 face-up card your opponent controls; destroy it. When you Special Summon a monster(s) from your hand: You can target 1 "Akkedis" monster in your GY; Special Summon it. You can only use this effect of this card's name once per turn. Once per turn (Quick Effect): You can target 1 face-up monster your opponent controls and 1 face-up monster you control; return those targets to the hand. All Reptile monsters you control gain 300 ATK. 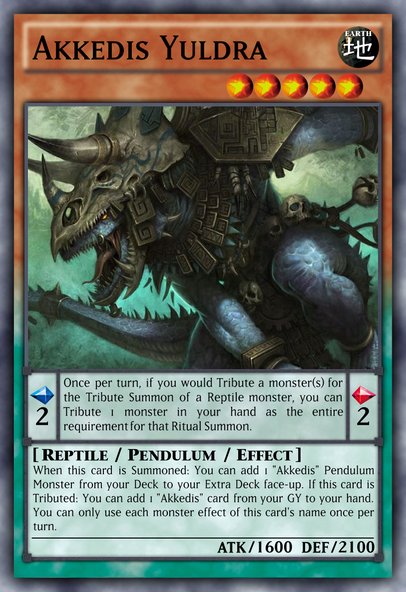 Once per turn: You can add 1 Reptile Pendulum Monster from face-up in your Extra Deck to your hand. If you control a Wyrm monster: You can target 1 "Akkedis" monster in you GY; shuffle it into your Deck, then draw 1 card. 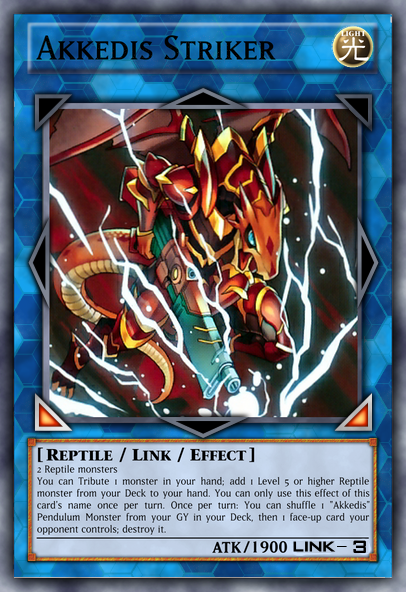 Activate this card by targeting 1 Reptile monster in your GY; Special Summon it, and if you do, equip it with this card, also negate its effects if it is not a Pendulum Monster. You can only activate 1 "Akkedis Resurgence" per turn. 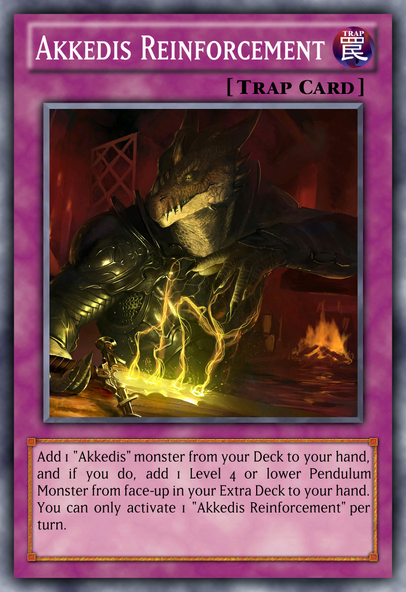 Add 1 "Akkedis" monster from your Deck to your hand, and if you do, add 1 Level 4 or lower Pendulum Monster from face-up in your Extra Deck to your hand. You can only activate 1 "Akkedis Reinforcement" per turn. I know this is another large archetype, but any form of CnC would be nice!